"From day one we felt welcomed into the school community by the teachers and other families." Thank you for your interest in our school! We are now accepting applications for new families for the 2019-2020 school year based on availability. ​It&apos;s easy to apply, just follow these simple steps! Step 1: Visit us and take a tour of our school! We have several open houses throughout the year, call the Advancement Director to schedule a visit at (610) 933-7562, or click here to request a tour online. Click here to complete the student application online. Step 3: Apply for tuition assistance, if needed. Once your application has been received, we will follow up with each applicant to detail the next steps in the registration process. Documentation details are found in the Registration Checklist. Re-registration is now open at Holy Family School for the 2019-2020 school year for current families. Please take a moment to carefully read the information below regarding the enrollment process. Families looking to enroll younger siblings not yet enrolled at Holy Family School may include them with the re-registration of current students. Payment can be made online by clicking here. For more detailed Online Payment instructions click here. 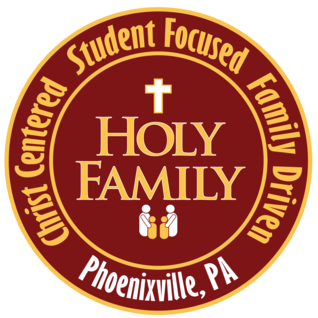 Holy Family School resides in the Phoenixville Area School District and complies with state and local policies. Students entering PreK or Kindergarten must be 3, 4, or 5 years of age by September 30th. All children entering PreK-3 and PreK-4 must be toilet independent before starting. Custody Forms must be filled out for all children of divorced or separated families. Holy Family School welcomes students of any race, religion, color, national and ethnic origin. Non-Catholic students must fulfill all the requirements of the curriculm including the study of the Catholic religion attending all religious functions offered as part of the school program. In addition to the admission requirements listed above, acceptance in grades two through eight is conditional, pending a review of academic and behavioral records. An interview with the school principal may be a requirement of registration.